A pineocytoma, also known as a pinealocytoma or pinealoma, is a rare benign tumor of the pineal gland of the brain. This brain tumor arises from the cells of the pineal itself. Since pinealocytoma is rare, other types of tumors are more common in the pineal region, such as a pineal germinoma or even a glioma. There is usually no known cause for pineal tumors. The pineal sits near the center of the brain between the two hemispheres of the brain, behind the thalamus and third ventricle, one of the fluid-filled spaces in the brain, and just above the posterior midbrain. Most of these types of tumors are considered low-grade or benign tumors. However, tumors of the pineal gland itself can very in aggressiveness with high-grade or malignant variants also occurring. These high-grade variants are termed pineoblastoma and display much more primitive or undifferentiated pathology. 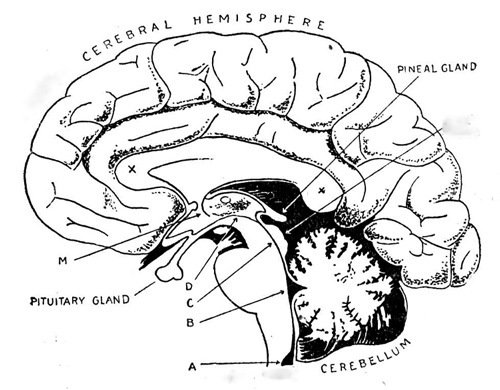 The pineal gland sits behind the third ventricle, a fluid-filled space in the brain, and near the cerebral aqueduct, a narrow passage through which the cerebrospinal fluid passes. For this reason, as a pineal tumor, such as a pineocytoma, enlarges it can compress the aqueduct and block the normal flow of cerebrospinal fluid. This can lead to a condition known as hydrocephalus which results in enlargement of the ventricles and increased pressure in the head. This can lead to symptoms such as headache, nausea, vomiting and finally neurological deterioration as it becomes more severe. Other symptoms which can occur in some patients include a paralysis of upward gaze of the eyes (due to compression of part of the brain stem called the superior colliculi), disturbances of gait and precocious puberty in children. In a patient who presents with symptoms suggestive of a pineocytoma, a thorough neurological evaluation usually includes a neuro exam and a neuroimaging study such as a CT scan or MRI scan. A contrast MRI scan is the most preferred study to clearly define the tumor and its relationship to surrounding structures. While an MRI can identify most tumors and indicate their location in the region of the pineal gland, in most patients the type of tumor cannot be identified definitively without a biopsy of tumor tissue to be evaluated by a pathologist. Pineocytoma is a relatively rare tumor of the pineal region and therefore is often not diagnosed until a surgical procedure can obtain tumor tissue for analysis. In the case of pineal region tumors, some patients will undergo blood and/or cerebrospinal fluid sampling so that they can be analyzed for two compounds, beta-HCG (human chorionic gonadotropin) and AFP (alpha-feto protein). These compounds can be produced by some types of germ cell tumors. Pineocytoma however does not produce either. Treatment for pinealoma varies from patient to patient depending on specifics of each case such as age, tumor size and presenting symptoms. While other pineal tumors such as germinoma are very sensitive to radiation, surgical removal of pineocytomas is often preferable. The aim of surgery can be to both obtain tumor tissue to analyze to make a definitive diagnosis and to remove as much of the tumor as possible. Various approaches to the pineal region can be used by neurosurgeons. In general, the procedures require a craniotomy (opening of the skull) in the posterior part of the head and is directed either above the cerebellum or between the occipital hemispheres to reach the pineal region. Some patients will undergo other treatments such as radiation treatments for residual tumor or chemotherapy, particular in more malignant tumors. Because the appropriate treatment varies considerably from patient to patient, each case should be evaluated and discussed with the patient's own treating physicians.